New Brunswick/Newark, N.J. – New oncology leaders for Rutgers Cancer Institute of New Jersey at University Hospital in Newark have been named, further enhancing the facility’s expertise and ability to deliver National Cancer Institute (NCI)-designated Comprehensive Cancer Center services to the greater Essex County region. Serving as the new director for Rutgers Cancer Institute of New Jersey at University Hospital is Wadih Arap, MD, PhD. Previously, Dr. Arap served as Chief of the Hematology/Oncology Division and Deputy Director at the University of New Mexico Comprehensive Cancer Center. Upon his recent arrival to the Newark facility, Arap assumed the director role from Susan Goodin, PharmD professor of medicine at Rutgers Robert Wood Johnson Medical School, who served in an interim capacity. Arap also will serve as chief in the Division of Hematology/Oncology in the Department of Medicine at Rutgers New Jersey Medical School. Since 2016, the multidisciplinary cancer service line at University Hospital in Newark has included care provided by Rutgers Cancer Institute medical and surgical oncologists augmenting radiation oncology services which have been provided there since 2009. Arap aims to build on the partnership goals of enhancing clinical trial access to patients in the region as well as expanding community outreach, education and screening programs. “Dr. Arap’s research and clinical expertise complements the mission of Rutgers Cancer Institute – the state’s only NCI-designated Comprehensive Cancer Center. Under his leadership, opportunities will be developed to reduce cancer incidence and improve patient outcomes through enhanced clinical services and research,” notes Rutgers Cancer Institute Director Steven K. Libutti, MD, FACS, who is also senior vice president of oncology services at RWJBarnabas Health and vice chancellor for cancer programs for Rutgers Biomedical and Health Sciences. “Increasing cancer care access and educating our communities about cancer prevention remain significant needs for the greater Essex County region. I am confident that continued attention will be paid to enhance these areas under Dr. Arap’s direction,” adds University Hospital President and CEO John N. Kastanis, MBA, FACHE. Adding to the leadership on the Newark campus, Renata Pasqualini, PhD, has been named as chief of the Division of Cancer Biology in the Department of Radiation Oncology at Rutgers New Jersey Medical School. Prior to her new role, Dr. Pasqualini served as Associate Director for Translational Research and Chief of the Division of Molecular Medicine at the University of New Mexico Comprehensive Cancer Center. Drs. Pasqualini and Arap have led a joint laboratory program for 20 years. Each has previously held leadership positions during their 14-year tenure at the University of Texas MD Anderson Cancer Center. 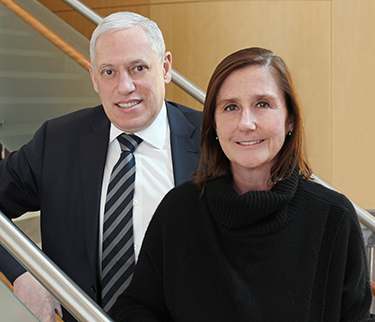 As a husband-and-wife team, they have been well-funded by the National Institutes of Health, the National Cancer Institute, the Department of Defense, among several other biotechnology-based and philanthropic entities. Together, they made groundbreaking discoveries about the diversity of blood vessels in normal and diseased organs. They developed a system to identify different molecular signatures based on where they are located in the body. They showed that these so-called “vascular ZIP codes” may be used to selectively deliver therapeutic and diagnostic agents in diseases such as cancer, obesity, and blinding eye disorders. The couple advanced their studies of the vascular and lymphatic system from laboratory models into human patients, and realized they could, in fact, potentially develop targeted therapies. Together, they have published more than 200 original joint peer-reviewed research manuscripts and, with very few exceptions, such publications are a collaborative team scientific effort. More than 100 patents have been filed worldwide, based on intellectual property developed in their laboratory program. Leading a program that is transformative, multidisciplinary, and highly translational, Arap and Pasqualini say they hope to be able to bring important advances to science and medicine, as they actively integrate research and drug development efforts at the Rutgers Cancer Institute of New Jersey at University Hospital in Newark. University Hospital is an independent medical center with more than 500 licensed beds, an active medical staff of more than 600, and over 3,000 employees. Located in the Central Ward of Newark, New Jersey, University Hospital is a regional resource for advanced care in a wide range of medical specialties. University Hospital was awarded the prestigious Gold Plus recognition by the American Heart Association and the American Stroke Association for Heart Failure and Stroke. Designated as the Level 1 Trauma Center for Northern New Jersey, the Hospital maintains 24-hour in-house coverage by general surgeons, and prompt availability of care in specialties such as orthopedic surgery, neurosurgery, internal medicine, plastic surgery, and pediatrics. As part of its mission to serve the residents of Newark and surrounding communities, University Hospital is also proud to be the principal teaching hospital of the schools of Rutgers Biomedical and Health Sciences, including New Jersey Medical School, the School of Dental Medicine, the School of Health Related Professions, and the School of Nursing. Learn more at www.uhnj.org.